Evidence which led to an Israeli soldier being charged over the death of a peace activist in the Gaza Strip is to be shown to his family's legal team. Lawyers representing the relatives of Tom Hurndall, 22, will now assess how high up the chain of command they think responsibility for his death lies. The Manchester student, from Tufnell Park, north London, was shot while helping Palestinian children in 2003. The trial of Sergeant Taysir Hayb, who denies manslaughter, resumes Wednesday. The soldier faces a total of six charges including two counts of obstruction of justice, one count of submitting false testimony, one count of obtaining false testimony and one count of unbecoming behaviour. He has denied them all at the trial at a military base near Tel Aviv. The trial began on 10 May but has been adjourned for much of the time. Mr Hurndall fell into a coma after the shooting in Rafah and died in January this year. His family's legal team had been denied access to a Military Police report which led to Sgt Hayb being charged. When an appeal was launched at the Supreme Court the state prosecution offered the legal team, but not Mr Hurndall's family, access to the documents. The team, who accepted the offer, will look to see if the evidence suggests the soldier should face the more serious charge of murder and whether anyone else should be indicted. 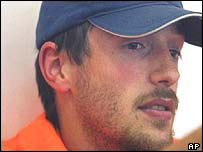 Carl Arrindell, a family friend and spokesman for the Tom Hurndall Foundation, said: "This is a major step forward in our campaign to find out exactly how Tom died and who is responsible. "The implications of getting access to this evidence are substantial. "We took this to the supreme court when we discovered that promises from the Israeli Government of transparency and openness were ill founded." The case is listed to run for two days from Wednesday and the main hearing is expected to take place.